A new documentary, to be shown tonight, gained unprecedented access to two of Ireland’s prisons over an entire year. A NEW OBSERVATIONAL documentary has gone behind bars and followed the lives of six prisoners over one year. Starting on RTÉ ONE tonight at 9.35pm, Life on the Inside explores the lives of those who live and work in both Wheatfield and Shelton Abbey prisons. Director Traolach Ó Buachalla told TheJournal.ie that it took a full two years of negotiations to gain access. Access was only the beginning, however. “It took a long long time to gain trust, both from the prisoners and to a lesser extent, the prison officers,” Ó Buachalla said. 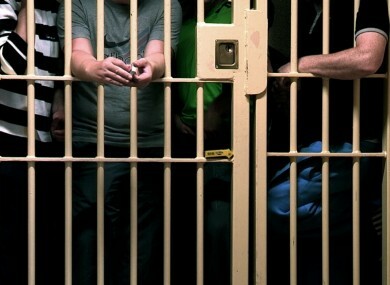 The documentary examines the differences between the two prisons, and the adjustment that prisoners have to make between spending up to 18-hours per day in a cell in Clondalkin’s Wheatfield prison, in Dublin 22, to the relative openness of the low security Shelton Abbey prison in Arklow, Co Wicklow. The six prisoners which the programme follows have a range of convictions, from drug offences to murder. Recalling the first day of filming, Ó Buachalla admits that he didn’t quite know what to expect. On the first day I had nothing but preconceptions. Most of these were from the movies, to be honest. Some were lived up to and others not at all. We made a point of not going in there with any agenda. We weren’t looking to film an exposé. While safety was an issue, Ó Buachalla said that this was more of an everyday concern, rather than being specific to their environment. “If you find yourself filming in Temple Bar at midnight, you’re concerned for your safety,” he said. Filming in the prison on Christmas Day, Ó Buachalla was expecting something very different. “I was the one making a big thing about it being Christmas Day,” he said. The only difference to the prisoners’ routine that day, he said, was the addition of a breakfast fry-up. After a year of filming, it’s the sounds of prison life that have stuck with the director. “It was so quiet at some points and so noisy at other times,” he said. Ó Buachalla hopes that viewers, having watched the programme, will draw their own conclusions as to what they want from their prison service. Email “Prison life: ‘Christmas was just like any other day – a fry-up and that’s it’”. Feedback on “Prison life: ‘Christmas was just like any other day – a fry-up and that’s it’”.